Travel through the cosmos, visit strange and wonderful alien worlds, encounter fantastical and bizarre creatures. 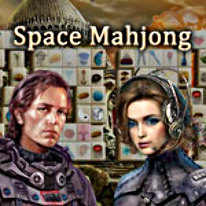 Space Mahjong has 7 different types of Mah Jong gameplay to choose from, including Crossed Lines, All By Picture, Logical Pair and a one minute timed round, each set in a unique and beautifully rendered alien environment. With hours of Mahjong gameplay, gorgeous graphics and soothing score, Space Mahjong will delight Maj Jong fans of all ages.